The Sunshine School is celebrating the success of their students after their exams. 35 children passed their Grade 5 scholarship exam with more than 70%. These children can now attend the best school in the area with a free school uniform and their families will receive 2,000 rupees a month. It really is a life changing opportunity for these students in Sri Lanka. Congratulations to the Head teacher, staff, students and their families for all their hard work. We have 3 new additions to our University Support Programme - our Foundation is financially supporting two more medical students, Suntharasivam Kokilan and Rajendran Thatchayanan, with Medical College Scholarships attending the University of Sri Jeyawardanapura, Sri Lanka and one law student, Thiyagaraj Thanushapriya, attending the Law College at the University of Colombo. We all wish them every success with their studies. The lovely Premy, an AYM Instructor from Colombo, made home visits to Killinochchi to help children and adults with Special Needs and Abilities. The Special Yoga Global Network is supporting the ‘Special Children’ Project in Sri Lanka by training teachers, midwives & parents and Heart Of Living Yoga funds that work. The Elders Wisdom Breakfast Club started on the 8th December 2016 and continued for 5 days a week with 45 adults benefiting from the project. On 30th April 2017 it changed to 3 days a week and has 29 adults and a baby attending. 10 adults also have food delivered to their homes as they are unable to attend due to infirmity. Flasks and heavy duty mosquito nets and new bedding have been given to those who requested them. A Free Medical Check-up Camp for Senior Citizens and Children with Special Needs started on 19th February 2017 at Pudumuripukullam. This project discussion and meeting took place on 11th November 2015 at Killinochci. HOLY is working to help with the trauma healing of the widows and to raise money to assist in setting up a Women’s Co-operative so the women can achieve a much-needed steady income and some security for their children. 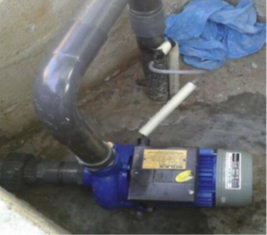 A Water Pump Motor was donated to Ms. Sivabagyam and installed at her home. Ms. Sivabagyam is the lady who co-ordinates the Elders Wisdom Breakfast Club and carries the hot food for them on the back of a motor bike, with the hot food container burning her leg! Without this water pump this important meal for the elders could not happen. A young boy with physical challenges has had a western style toilet built at his family home and has also been donated a bicycle. Due to the difficulties of transport, the parents and the child have asked for home schooling arrangements which we are arranging. A young woman with Special Needs is being assisted with food rations and help with nutrition. Every month we arrange for a Spiritual Puja to take place in our village on a Full Moon. Mr & Mrs Alagi have received rations each month since 2016. Mrs Alagi is in a wheelchair pictured in the photo below. The construction of a brick house for them, complete with inside western toilet, has finally been completed. If you wish to donate to support any of our work, please click on the Donate button below. Thank You.